Home News City Culture, Labor and Strawberries: How is Food Political? Culture, Labor and Strawberries: How is Food Political? Food affects cultural history, cost of living and authority. This mix of food and politics is prominent in the small, central California coastal town of Watsonville — with the strawberry at the heart of it all. University Library, University of California Santa Cruz. From Randall Jarrell, Interviewer and Editor. “Hiroshi Shikuma: Strawberry Growing in the Pajaro Valley” (Regional History Project, UCSC Library, 1986). Food production is a major contributor to the economy, especially in California. Agriculture is one of the largest industries and creates almost half a million jobs, including the 14,900 jobs created by berry production on the Central Coast. Watsonville, a town of only 50,000, is incredibly diverse. This has allowed the politics of this community, established through agriculture, to play out through generations. Before President Donald Trump was elected and began to target undocumented immigrants, before César Chávez fought for fair labor conditions, before the internment of Japanese Americans during World War II — there were strawberries. Since first introduced by the Spanish, strawberries have been a major constant in the narrative of this region. In Watsonville the economy is centered around strawberries, Guthman said, and it is highly lucrative. Yet, it has also perpetuated issues in the area like high land values. This is because land is priced for the cost of strawberries, which makes it nearly impossible to sell for other crops and developments. The strawberry is one of the most pesticide and labor-intensive crops. The system in place is a cycle, Guthman said. When the industry grows, it creates more problems, like a diminishing labor force and increased pesticide use. “What makes strawberry production successful is also what has been threatening it,” Guthman said. Mas Hashimoto remembers picking strawberries in the Pajaro Valley alongside his mother and brothers from 10 years old well into high school. It was back-breaking labor, he said, and he was even once crop dusted by pesticides. This was nearly 70 years ago ­— before he was drafted into the Army and before he was sent to the Poston internment camp in Arizona — but he remembers it clearly. 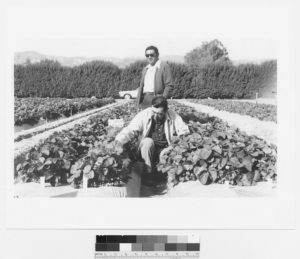 By 1940, Hashimoto and other Japanese Americans grew almost 40 percent of the vegetables in California. Now Hashimoto is in his 80s, living in the Pajaro Valley with his wife Marcia. They have watched the culture of Watsonville and its agriculture change significantly. Marcia said the Japanese community is much smaller now — children follow careers and individuals marry outside of the ethnicity, a different picture than 1940s Watsonville. Once the largest Asian immigrant minority in Watsonville, they are now only the sixth largest. The number of Japanese and Japanese American growers has also significantly decreased, Guthman said, and the majority of growers and workers in the Pajaro Valley are now Latinx. A lot has changed since Mas Hashimoto picked strawberries in the fields at the age of ten. Instead of the short handle hoes Hashimoto would have to use to pick lettuce and strawberries, workers now use long-handled hoes that allow workers to stand. Hashimoto said this is because César Chávez and the United Farm Workers Association fought for fairer labor conditions like child labor laws, the right to unionize and better wages. But much still feels too similar to workers. The March Collective has been working collectively with other activist groups like the Brown Berets in Watsonville and Sanctuary Santa Cruz for fairer treatment for field workers, especially those who are undocumented. This activism is especially prominent during the strawberry harvest season, which is in peak from April through June. However, many growers in the Central Coast grow strands of berries that are ripe close to all year round, Julie Guthman said. Strawberries are still one of the most pesticide and labor-intensive crops, Guthman said, making labor conditions terrible. Previous articleSUBMISSION: When does CAPS do more harm than good?